Everyone loves a treat. Whether you have a sweet tooth or not there’s always an occasion when you just really fancy something sweet and tasty. For most of us we have the option of just popping to the local shop and buying ourselves some biscuits or a chocolate bar. But unfortunately for sufferers of food allergies this isn’t always an option. Simple things like grabbing a snack can be a little more complicated. People with food allergies have to be sure they know exactly what is in the food they are eating. Consuming something that contains even a trace of the substance they are allergic to can lead to a nasty reaction that can, on occasions, require hospital treatment. There are a variety of food allergies and one of the most well know is an intolerance to gluten. Sufferers can suffer some serious affects if they accidentally eat a gluten-based products. The reaction can include stomach cramps, nausea, dizziness and, in some very serious cases, organ problems. But just because you have an intolerance to gluten it does not mean you should not be able to enjoy yourself and have a treat once in a while like everybody else! 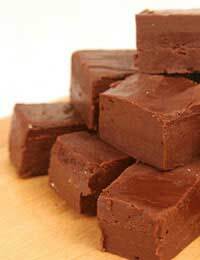 This fabulous gluten-free fudge is delicious, easy to make and complete safe for you to eat. To make this tasty treat you will need 800g of sugar, 65g of cocoa powder, half a teaspoon of salt, 120ml of milk, a teaspoon of vanilla flavouring and about 50g of butter – yes this is not one for the weight conscious but a little treat every now and again never did anyone any harm! To begin with you will need a casserole dish. Add the sugar, salt, milk, vanilla flavouring and cocoa powder to the dish and mix until the ingredients combine. Don’t worry about mixing too vigorously, just as long as the ingredients are somewhat blended together that is fine. Now add the butter to the mixture but don’t mix it in. Just place it in the middle of the dish. Place the dish in the microwave and cook on full power for about two and a half minutes. Once the time is up remove the dish from the microwave and stir the mixture until the butter is combined with all the other ingredients and there are no lumps. Finally poor the mixture into a square or rectangular tin and put it in the fridge. You’ll need to let it chill in the fridge for about an hour and a half.When the time is up remove the tin from the fridge, empty the fudge onto a chopping board and cut or break up into small pieces. This quick and easy gluten-free fudge is perfect for when you have friends coming over at short notice. In less than two hours you’ll have yourself a tasty snack that everyone is bound to enjoy – and you needn’t tell them how simple it was to make!